Seattle Music Commissioner Jennifer Czeisler currently runs Rogue Octopus, a sync licensing company focused on Northwest artists and labels, and previously served as Vice President of Licensing at Sup Pop Records for 16 years. A Seattle native and graduate from the University of Washington School of Law, Jen left her position at Sub Pop in 2012 to create Rogue Octopus. Over her years as a music industry attorney, Jen has negotiated and drafted hundreds of recording contracts, licensing agreements and foreign distribution agreements. Jen’s abilities have showcased themselves in music placements for Sub Pop bands The Shins, The Postal Service, Fleet Foxes, Band of Horses, as well as local indie artists on Rogue Octopus such as Tangerine, Smokey Brights, Hot Bodies In Motion, J. Pinder, Sweet Water and more. Seattle Film + Music and Special Events Director, Kate Becker reflected on her experience at Canadian Music Week and the Music Cities Summit. On Friday, Michele Alosinac, Film Sector Development Officer in the Toronto Office of Film & Entertainment Industries, took me on a tour of Cinescape Film Studios, one of twenty soundstages in a booming film industry there. I also met with Zaib Shaikh, Director of Entertainment Industries for the City of Toronto. My Canadian counterparts were very forthcoming in sharing information and touring me around their beautiful city, where film is a giant industry. They reportedly cannot build soundstages fast enough to meet the demands of the industry. In 2015 alone, Toronto had a $1.5 billion film industry. ‘Downsizing’ was filming in the streets while I was there. Saturday was the Music Cities Summit, which was solidly fantastic with music city leaders from around the world. Mayor John Tory opened the summit and spoke about the economic and cultural importance of the music sector to his city. I spoke about music city ecosystems on a panel with Bryce Merrill (Denver), Andreas Kalogiannides (Toronto) and Mark Grice (Adelaide, Australia). The panel was moderated by Ben Raynor, music critic at the Toronto Star. Just over 200 music city leaders participated in the Music Cities Summit. 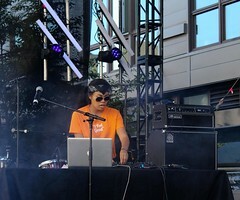 More than 29,000 people attended Canadian Music Week. One of the highlights of the Music Cities Summit was my participation in mentoring sessions, where I met with emerging musicians, promoters, and music-related creatives. Always love this. It was amazing to have this opportunity, sponsored in part by Canadian Music Week, to learn about Toronto’s film industry, meet with music city leaders from around the world, discuss challenges and best practices, and have Seattle contribute to the evolution of this field. One Reel is pleased to announce the 2016 City of Music Career Day, which will take place at EMP Museum and The Vera Project on Saturday, March 12, 9am – 4pm. Seattle music icon, Sir Mix-a-Lot, and Seattle Symphony Music Director, Ludovic Morlot, will be making this year’s keynote remarks to kickoff the event. SassyBlack of THEESatisfaction will be taking part in an Artist panel for attendees interested in performing music as a career. Other accomplished music professionals who will be participating in panels and workshops include Kimya Dawson of the Moldy Peaches; Seattle recording artist, Kris Orlowski; Shaina Foley, Production Manager at The Crocodile; Cecilia Corsano-Leopizzi, Marketing Director of Decibel Festival; John Gilbreath, Executive Director of Earshot Jazz Festival; and more. REGISTRATION IS NOW OPEN. Attendees will receive free Metro Transit passes for their return trip at registration upon request. 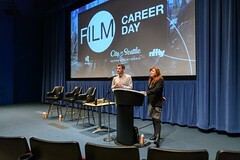 For more information and to register, visit www.careerday.onereel.org. Space is limited and early registration is encouraged. City of Music Career Day is a free educational event for young people ages 16 – 24 who have an interest in working in the music industry. Participants will get direct access to music industry professionals through networking, experiential learning, and engaging workshops. Attendees will also be among the first to tour KEXP’s new Seattle Center home as part of the event. 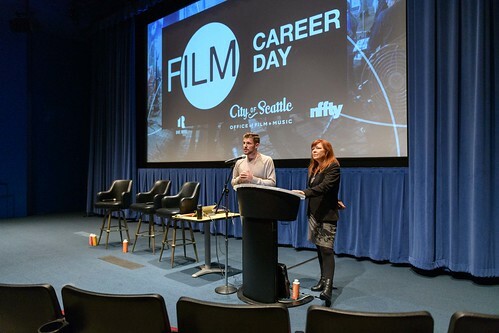 Career Day is presented in partnership with the Office of Film + Music, Seattle Office of Arts & Culture, EMP Museum, and The Vera Project. Major support is generously provided by The Boeing Company. Internship and volunteer opportunities will be highlighted during a career fair with regional companies and non-profit organizations focused on performance, concert production, audience development, record label operations, retail, journalism, and gaming. Fourth Annual City of Music Career Day Biggest (and Best) Yet! 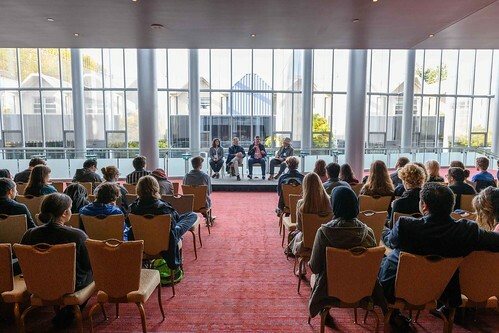 On Wednesday, April 22nd, over 300 high school juniors and seniors and college students from across the city and greater metropolitan area attended the fourth annual City of Music Career Day at Seattle Center. A Seattle Music Commission initiative, Career Day is an annual, one-day, free educational program that provides future leaders of Seattle’s creative community with direct access to music industry professionals through networking, experiential learning, engaging workshops, and performance. 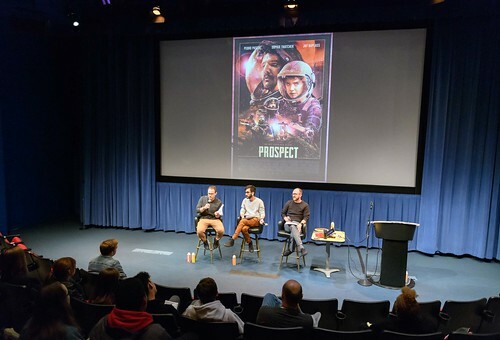 This year’s event was the largest to date and also marked the first City of Music Career Day event produced collaboratively by the Office of Film + Music, Office of Arts & Culture, EMP Museum, and One Reel. Mayor Murray set an inspiring tone for the day with his opening comments on how Seattle’s rich musical legacy set the framework for its current climate of musical exploration, creativity, and innovation. Office of Film + Music Director Kate Becker and Office of Arts & Culture Director Randy Engstrom also addressed the crowd and set the stage for keynote speakers Ryan Lewis (producer/musician) and Zach Quillan (manager, Macklemore & Ryan Lewis) to talk with KEXP’s John Richards about living and working in the music industry in Seattle. Students engaged with a wide variety of industry experts, learning about music career opportunities in performance, management, concert production, arts organizations, record label operations, retail, licensing, journalism, and broadcasting, through targeted breakout sessions. 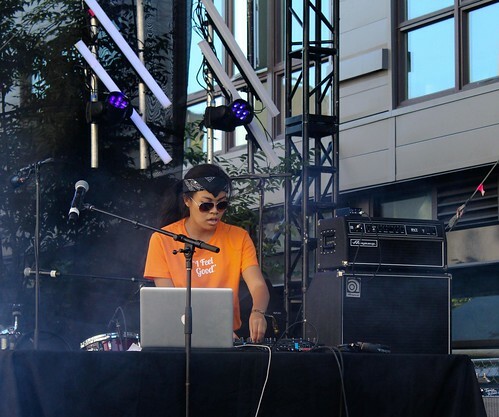 Sessions featured working musicians Hollis Wong-Wear, Tomo Nakayama, Erik Blood, and Vitamin D along with industry professionals from Rhapsody, DigiPen, AEG Live, Amazon, and others. Following the breakout sessions, students met one-on-one with mentors and talked with representatives from organizations including KEXP, The Recording Academy, Barsuk Records, Brown Paper Tickets, Sub Pop Records, Rain City Rock Camp for Girls, Votiv, Fremont Abbey Arts Center, and many more. The jam-packed day concluded with performances from Shaprece and Tomo Nakayama and, for the first time, an “After Party” where students networked with their peers, sharing their experience of the day and swapping stories. EMP Youth Advisory Board member Marco Schurgurensky DJ’d the After Party which featured City of Music Career Day cupcakes from Trophy Cupcakes. Feedback from the student attendees has been fantastic, and plans are already in the works to make City of Music Career Day 2016 even bigger and better. What’s your future look like? Any of these words come to mind: performance, concerts, venues, journalism, record labels, MUSIC? If so, you’ve come to right place. City of Music Career Day is a one-day educational program curated by One Reel that provides high school juniors and seniors, and college students direct access to music industry professionals. Networking, experiential learning, engaging workshops, and performance are all part of the perks of the day. The event is scheduled for April 10 and will take place at EMP Museum and the Vera Project at Seattle Center. Breakout sessions include The Artist, The Industry 1 (behind the stage), the Industry 2 (behind the scenes), and Backstage Pass. Panelists and moderators will include Danny Baird, Gloria Connors, Catherine Harris-White, and Andrew Joslyn. Register here to participate. SEATTLE (March 10, 2014) – Mayor Ed Murray announced today that the city is implementing a low cost, phased approach to make it easier for musician load-in and load-out at live music venues around the city. Here is how it works. Five music venues have been selected to pilot the program and have nearby load and unload zones modified. The zones prioritize musician’s use through branded signs. They include a yellow regulatory sign and City of Music™ branded ‘Priority Musicians Loading & Unloading’ sign. The City of Seattle invites other interested music venues to request similar load zones. To qualify for the Musician Load Zone program, interested businesses must meet the requirements defined in the Admissions Tax Exemption for Live Music Venues. If they do, the city will evaluate whether a load zone is feasible. Businesses interested in a musicians priority load zone sign should contact Rachel White, OFM’s Music and Creative Industries Program Manager at rachel.white@seattle.gov or 206-684-8504. Click here to read the full news release. See pictures here, here, and here. In 2004, The City of Seattle designated that the first Monday after Labor Day through the following Sunday be known as Buskers Week. In honor of Buskers Week, the Seattle Municipal Tower will be participating in this year’s celebration by featuring five performances by Seattle street musicians on the Level Six Plaza during the week of September 9-13. All performances will be from 11:30 a.m. to 1:30 p.m. Performers include: Wasserman, Raven Zoe, Razz, Jim Page, and Whitney Monge. To raise awareness of the economic impact of music, the Seattle Metropolitan Chamber of Commerce is announcing its plan tonight at the Triple Door to propel Seattle’s music community and industry to the forefront of a rapidly expanding creative economy. The Chamber has formed a joint taskforce of business leaders and Music Commissioners that will advance industry promotion strategies, professional development opportunities and music industry related issues in the Chamber’s advocacy agenda. The first feature product of the partnership is a City of Music app. Produced by local app developer, FrontRunner, this new app brings to one place curated streaming local music, concert calendars, mini doc videos and information about local music at the Sea-Tac Airport. 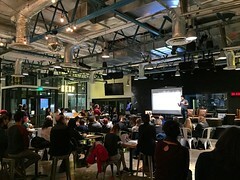 The content for the app is provided by local partners KEXP, PlayNetwork, Jet City Stream, SSGMusic, Rainy Dawg Radio, Seattle Weekly, Seattle Times, 107.7 The END, Sound on the Sound, The Stranger and Sport’n Life Records. The Chamber’s music initiative underscores the community’s desire to champion Seattle as the City of Music through significant investment that goes above and beyond the scope of everyday business. Community-driven efforts will continue to grow the City of Music Initiative, enhance the climate for our music industry, and push Seattle’s leadership role in music throughout the nation and the world.